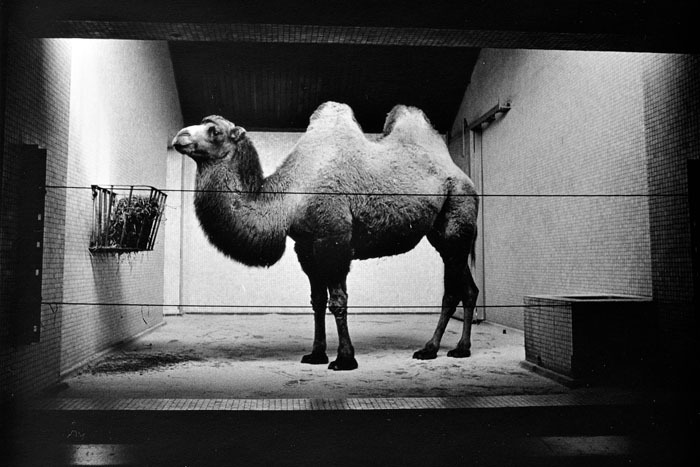 Bactrian Camel, Zoo Series, London 1992. © Britta Jaschinski. Zoos are obviously bad for animals, cruel to animals, but beyond that, they’re bad places for people to learn how we relate to the other creatures with whom we share the planet. Zoos are a case study of people’s environmental short-sightedness. After and beyond the experience of zoogoing, people behave like imperious emperors toward the rest of the world, overconsuming, unsustainably harvesting plants, animals, minerals, oil, land, and yet remaining in denial about our impact on the planet. Our disregard for animals, our displacement of them, betokens a larger environmental hubris, or blindness. Zoos promote sloppy, imperial animal-looking and animal-thinking, which generates a sloppy, self-serving, inauthentic environmental sensibility. To confront overarching questions about how people construct and interact with “the environment,” a consideration of zoos offers a good ingress. The cultural history of the zoo is a history of human assaults upon other animals, and upon the rest of nature. Zoogoing is a model of imperial exploitation of the natural world. Zoos exist because people want to make animals conveniently accessible and visible, but there is nothing convenient about wild animals. They are complicated, enigmatic, entropic. Jaschinski’s photography embraces this complexity, and subverts our urge to simplify and reduce their lives.